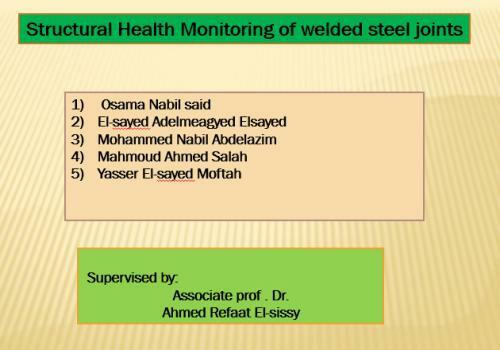 In the present project, SHM welded steel pipes was used to diagnosis their state via vibration based damage detection techniques .these techniques are based on the principle that damage alters the dynamic properties of the structure such as mass, stiffness and damping . It is therefore feasible to utilize the measured dynamic quantities such as Frequency Response Functions (FRFs) and modal parameters from structural vibration to detect damage. Two most commonly used welding techniques were used, namely: shielded metal arc welding (SMAW) and gas tungsten arc welding (GTAW). An artificial crack with depth of 2 mm, and width of 1mm were made in the welded region. Static tests were performed to assure the quality of welded joints .these tests include: three point bending test (3PB), face bending, tensile testing, and buckling test. All the tests were made in accordance with the ASTM specification. In addition to the destructive tests, nondestructive tests were performed, there include: x- ray and liquid penetration inspection methods. Dynamic tests were performed via an impact on a pipe, where three uniaxial accelerometers were kept at a certain location as a reference, and the pipe was impacted at 24 points. The data were acquired through FFT pulse analyzer, set on linear averaging mode, with a maximum frequency of analysis of 3.2 KHZ.
" متابعة السلامه الإنشائية لمواسير الصلب الملحومه"
مواسير الصلب الملحومة لها العديد من التطبيقات الهندسية في نقل الغاز والبترول وكذا غلايات الطاقة. ومن المعروف أن الوصلات الملحومه تمثل مرجعين للانهيارات نظراً لاحتوائها علي العديد من العيوب إضافة إلي الأجهارات المتبقية والتي لا يظهر تأثيرها إلا بعد مرور فترة من الزمن. لذا يهدف المشروع إلي استخدام اسلوب متابعة السلامه الانشائية لمواسير الصلب الملحومه بطريقتين (القوس الكهربي المحجب ولحام التنجستن) وهما الأكثر شيوعاً في هذا المجال .. ويعتمد أسلوب المتابعة علي تحديد ما يعرف بالبصمه عند بدء الاستخدام للوصله حيث يتم قياس الاخماد والتردد الطبيعي للمواسير ومن ثم قياس التغيرفي تلك القيم عند احداث شرخ بعمق 2 مم وعرضه 0.5 مم في منطقه الحام .. مما يوصلنا إلى اتخاذ الاجراءات الصيانه الملائمه تقادياً لحدوث الانهيارات وأيضاً يغدو بالامكان تقدير العمر المتبقي لتلك المواسير.